Nicolas Roche bears the cuts and bruises of a very nasty crash. But he managed to get away with it after some vital assistance from Rory Sutherland. 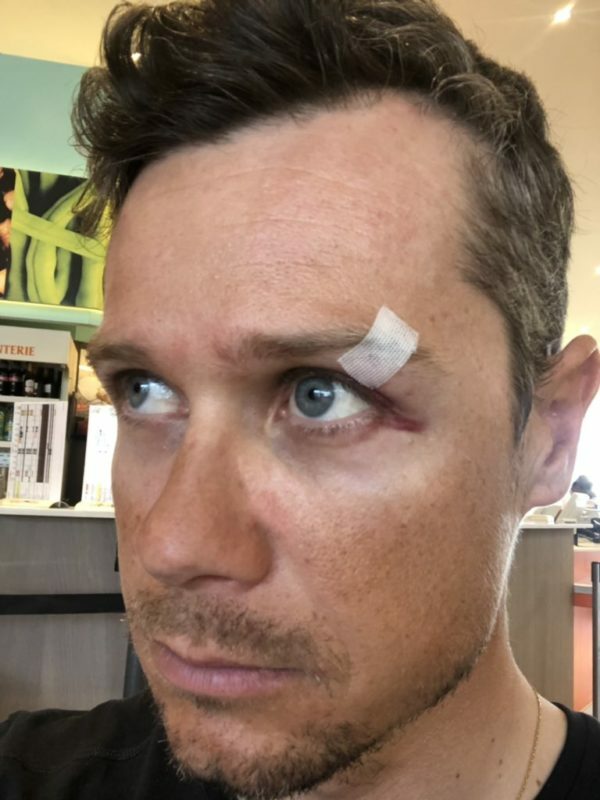 Nicolas Roche’s Team Sunweb squad has suffered a number of bad mishaps of late and the Irishman very nearly added to that tally at the Tour of Basque Country. On Thursday’s stage 4 he crashed coming off a climb in the rain, landing some way off the road down into a field. It was marked out with a barbed wire fence, which Roche flew into. However, a combination of the kit he was wearing and his cousin’s team mate, Rory Sutherland, got him through. And while he took a serious bang and could play no further part in the race, he told stickybottle he would be back on the bike today. “I’ve been pretty lucky,” he said of the crash and the serious damage it could have done to him. “I headed into a field protected by barbed wire. Luckily I had glasses on and obviously a helmet. “I went head first and as you can see the cuts are very close to my eyes,” he added. However, while the wet conditions resulted in a number of falls, it also meant Roche was protected against the barbed wire he met with at speed. “I had both rain jackets on at the time so it prevented me from getting too many cuts,” he said. Aside from some facial cuts he also had another on his quads. But after taking yesterday off, he said he would be back training today. When he went down he was clearly shook for a moment and was attended to at the scene by the race medics. He had the presence of mind to wave one arm about in case he was not noticed as he had fallen down from road height. “I was one of those scary crashes but somehow you end up being lucky,” he said. “I had my hand up because I was afraid no one would see me. Luckily Rory Sutherland saw me and he had also crashed. “He waved his hands to make sure to point me out which was nice of him,” he added of the Australian and Dan Martin’s UAE Team Emirates team mate. The fact Roche has not broken bones and can get back out on the bike immediately will come as a relief to his team. It is preparing for the Giro, won two years ago by team leader Tom Dumoulin. And the Dutch rider heads into this next month’s race looking to podium. However, his domestique Wilco Kelderman suffered fractured vertebra in his neck in Catalunya. And Martijn Tusveld is sidelined with a broken jaw. Sam Oomen has pulled out of the Basque race with illness, though he and the team have said his withdrawal is precautionary.